V&F Newsletter 01 2013 - 20 June 2013 - nur in Englisch erhältlich! Welcome to the new release of our V&F Newsletter – a service of the V&F Analyse- und Messtechnik Team! V&F Analyse- und Messtechnik GmbH will focus their activities on the development and manufacturing of the V&F Analyzers and V&F Subsidiary products. To grant all our distributors and customers efficient services related to the V&F instruments we have decided to found a dedicated company for these tasks. 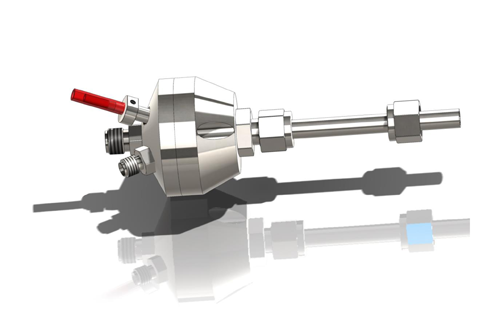 The "Heated Probe Tube" is an add-on product for the V&F process mass spectrometers that has been developed at V&F. 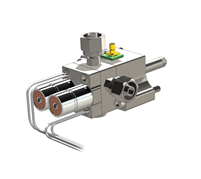 This connector is heated to more than 300°C and prevents condensation of the sample gas. 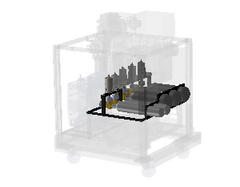 It enables a calibration of the V&F analyzer from the front end of the inlet. V&F has published a new document category called „Technical Descriptions“. You can download these documents in the download section. To get access to the documents a login to the V&F website is required. V&F Newsletter 02 2013 - 30 September 2013 - nur in Englisch erhältlich! The "Dual capillary Inlet" is an add-on product for the V&F process mass spectrometers that has been developed at V&F. 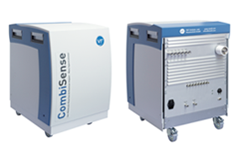 It can be mounted on the gas inlet panel of an analyzer and allows the user to switch between two sample gas inlets. V&F has published further documents in the category „Technical Descriptions“. You can download these documents in the download section. To get access to the documents a login to the V&F website is required. This new workflow will be initiated on the 1st of January 2014. Please send back all exchange articles that you have on stock by the end of this year. In 2014 you will get credit notes for returned articles only if you order an exchange article in parallel. You can find a list of affected articles and corresponding exchange articles here. V&F Newsletter 03 2013 - 16 Dezember 2013 - nur in Englisch erhältlich! 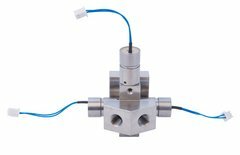 V&F has released a new add-on product for our range of process mass spectrometers: a Switchable Pressure regulating Unit. It allows the measurement of low and high concentration with one single configuration of the analyzer. This is realized with two inner capillaries (fused silica) with different diameters, which can be switched by valves. Microsoft Corporation will discontinue support for their operating system Windows XP within the 14th of April 2014. Some elder V&F software products like MCP, SCP and ACP have been developed to be executable within Microsoft Windows XP. These programs are not able to run natively with Windows Vista, Windows 7 or Windows 8. Neither using the Windows XP mode within Windows 7 or Windows 8 allows you to execute MCP, SCP and ACP. So the solution to operate MCP, SCP and ACP within a modern operating system like Windows 7 or Windows 8 is to install VMWare on the PC. VMWare allows you to install virtual machines on a physical machine (your PC) running under Windows 7 or Windows 8 with virtual machines that run under Windows XP.